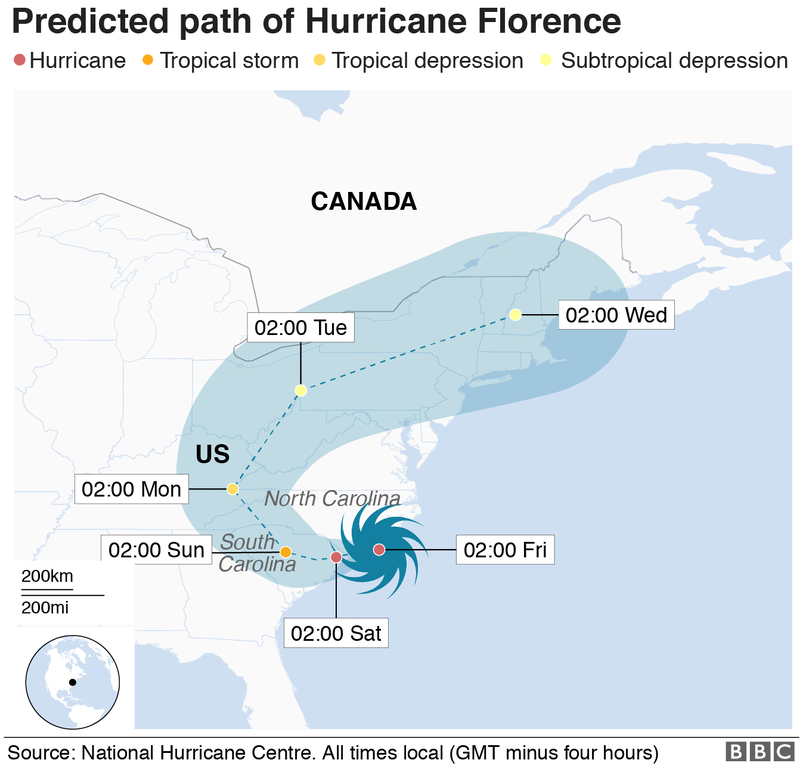 Hurricane Florence is due to make landfall on the eastern seaboard of the United States at 08:00 local time on Friday. At the same time, Super Typhoon Mangkhut is approaching the Philippines. There are spectacular images of both shot from space, and the two weather systems look almost the same. So why do we call one a hurricane and the other a typhoon? And while we’re at it – what exactly is a cyclone? They are all the same thing: tropical storms. But they are known by different names in different locations. In the North Atlantic Ocean and Northeast Pacific, they are called hurricanes. But if the same type of disturbance takes place in the Northwest Pacific Ocean, it is known as a typhoon. And in the South Pacific and Indian Ocean, cyclone is the correct term. How bad do storms have to be? A tropical cyclone is a generic term used by meteorologists. It means a rotating, organised system of clouds and thunderstorms that originates over tropical or subtropical waters, according to the National Oceanic and Atmospheric Administration of the US. Hurricanes are categorised between 1 to 5 based on their wind speed. In the Atlantic, it is hurricane season between 1 June and 30 November. More than 95% of tropical cyclone activity occurs during this period in this region. Typhoons in the Northwest Pacific Ocean are most common from May to October, although they can form year-round. And in the South Pacific, it’s cyclone season between November and April. The World Meteorological Organization, a UN body, maintains a list to name tropical cyclones around the world. The names of the deadliest ones like Typhoon Haiyan or Hurricane Katrina are retired and replaced. Countries in the regions of hurricanes, typhoons and cyclones send suggestions for the list to the global met authority. 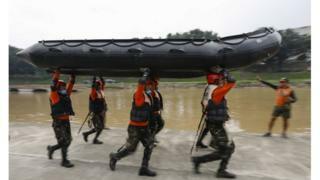 “Eight countries in our region, which covers the Bay of Bengal and the Arabian Sea, sent the list to the WMO during the early 2000s,” a senior scientist with the Indian Meteorological Department told the BBC. “Nearly 50% of those names for cyclones have been exhausted. Air rises quickly when it is heated by warm sea water. As the air cools down again it is pushed aside by more warm air rising below it. This cycle causes strong winds. Over the sea, a tropical storm can whip up huge waves. When these waves reach land they can flood large areas, including towns and cities. Over land the strong winds can cause a lot of damage – they can flatten homes, knock over trees and even tip over cars. 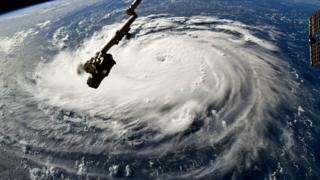 Scientists say the temperature of ocean water is going up and that can lead to hurricanes increasing in intensity in the future. They add that a hotter atmosphere can also hold more water, so this should allow hurricanes to dump more water on affected areas. There are many factors which make the relationship between climate change and hurricanes a complex one.